I’ve just had my first Christmas party and it’s got me thinking all about gluten free party food. 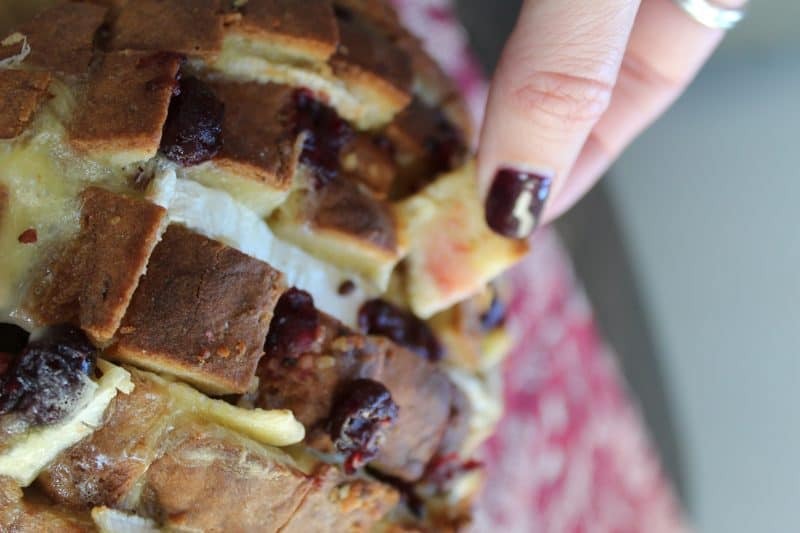 So I’m kicking off my party food recipes with something I’ve been wanting to try for a long time – a gluten free brie and cranberry ‘tear and share’ bread! 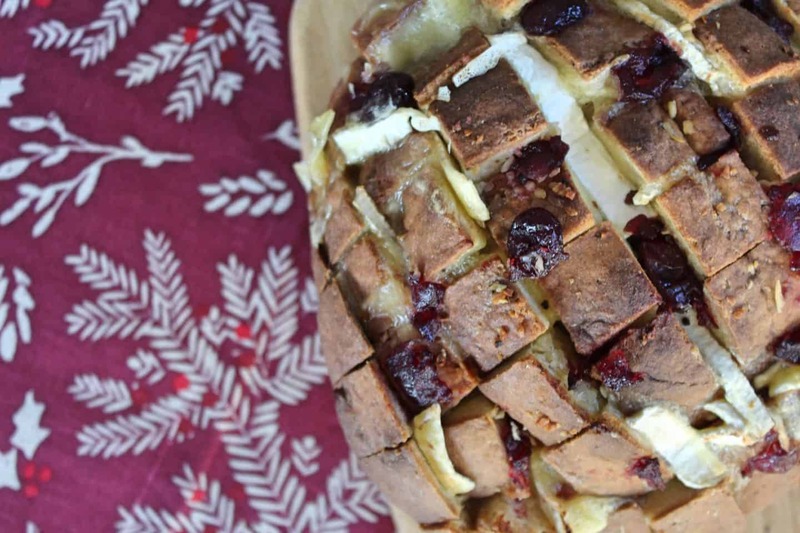 This really is the perfect centrepiece in a party spread, with delicious garlic butter, sweet pops of cranberry sauce and melted, oozing brie. I mean, could it get more festive than that!? It’s super easy to make and while it’s in the oven, you can lay out your entire party spread ready for this, the pièce de résistance! Now I am a massive cheese fan, so this is perfect for me! I can see this being enjoyed over a few cheeky glasses of red wine of an evening too! It would also be great food for a New Year’s Eve party, as it would certainly use up the leftover cranberry sauce! Of course, if you want to use more or less of any of the quantities in the recipe, be my guest! In fact, if you wanted to use up leftovers, you could also add some leftover ham to this as well. We always have a gammon or ham on Boxing Day, so pieces of this tucked into the gaps in the bread would be amazing! I just love how the outside goes really crunchy but the bread inside is so soft! If you’re not a brie fan, you could try this with stilton or mozzarella instead, depending how much of a cheese-lover you are! I just love the way the brie sort of oozes out of it – if you used another cheese it might not have the same effect, but I bet it would still taste amazing! For the bread I used a Warburton’s gluten free sourdough cob, which I picked up in Sainsbury’s. This is the ideal shape, but I’ve seen some other cob-style gluten free breads by Tesco and Promise Gluten Free, so there are plenty around for you to choose from. I bet the Warburton’s gluten free tiger loaf would also be a good option! I really want to show people on a gluten free diet that Christmas doesn’t have to be difficult! Some people might turn their noses up at the idea of gluten free bread if they don’t have to eat it, but I bet if you served them this, they wouldn’t even notice! I’ll be popping lots of Christmas tips on the blog over the next month, but I already have some party season tips and tricks here to get you started! 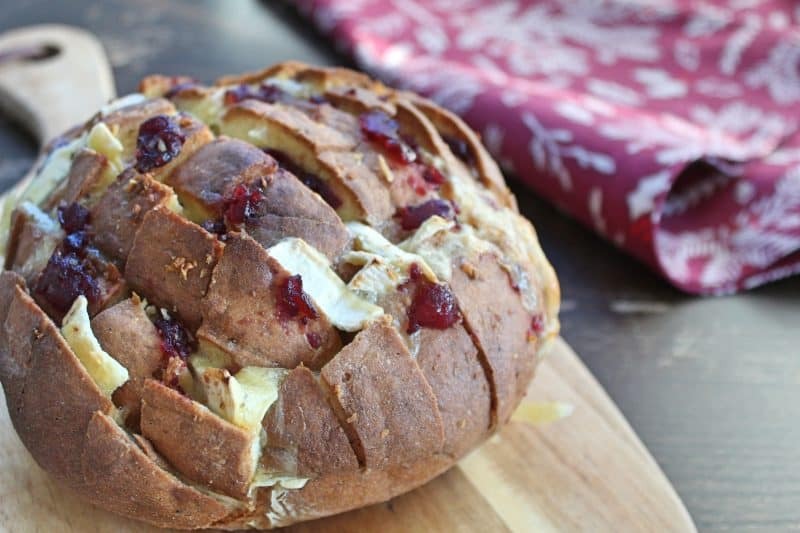 This gluten free 'tear and share' bread is stuffed with garlic butter, brie and cranberry - it's the perfect gluten free Christmas party food centrepiece! Preheat the oven to 175'C / Gas 4. Place a sheet of baking paper on a baking tray and set aside. Take the bread and using a serrated knife, cut in a cross-hatch pattern across it. You want to deep through the bread as possible, without cutting all the way. I cut half-way each way, and then each remaining half into thirds. Mix the garlic, salt and pepper into the melted butter and brush all over the bread. Use the brush to ensure the butter mix goes into the cuts as well. Slice the brie and place at random between the slices - you can do this as uniformly or randomly as you like, as long as you make sure it's evenly distributed. Then use a teaspoon to wedge the cranberry sauce into the gaps. Place on the baking tray and bake in the middle of the oven for around 30 minutes, until all the cheese has melted and the bread is hot through and a golden brown. Remove from the oven and cool for 5 minutes before serving warm. In the Christmas mood? 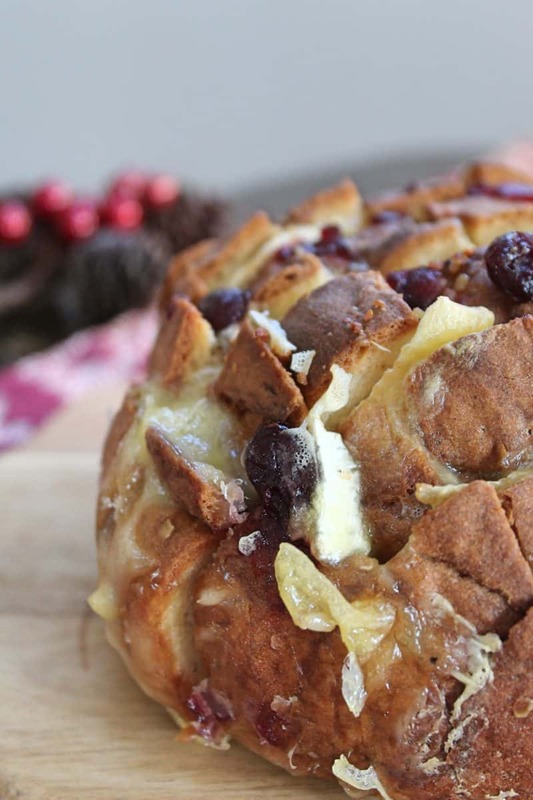 Here are a few other gluten free Christmas recipes for you to try! Oh – and don’t forget to check out my 10 things that happen to gluten free people in the build up to Christmas for a giggle too.